After several days on site our algorithms have locked in, the wind turbine’s spinning, the solar panels are charging, and for sure the wind has been blowing! The Synoptic system deployed for the BLUEcoast Project last week has been collecting data for a few days now and is already streaming back some great initial results. We are still waiting on a tidal calibration from a project partner which will help to level in some of the bathymetry, but you can clearly see Dunwich bank to the East and the strong tidal currents in the channel between the bank and the nearshore bars. We are all really excited to see how responsive this coastline will be to a strong easterly or north-easterly storm. Datasets from the Synoptic system left to right, raw wave images, surface current vectors, subtidal bathymetry. This radar system is deployed around 25 m above mean sea level on the cliff near to the coastguard cottages owned by the National Trust. 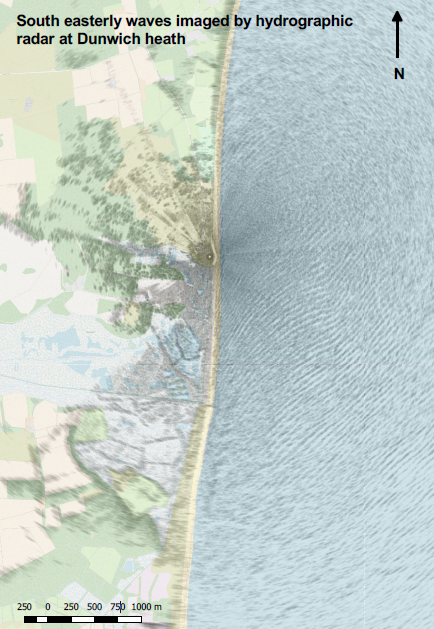 This elevation gives us a great view of the oncoming wave field with minimal shadowing at long range, the image below shows the a radar’s eye view of a wave field coming from the east with a slight change in direction as the waves propagate of Dunwich bank. We’re looking forward to seeing how the BLUEcoast team transform these data into some really useful information for the local coastal management authorities.